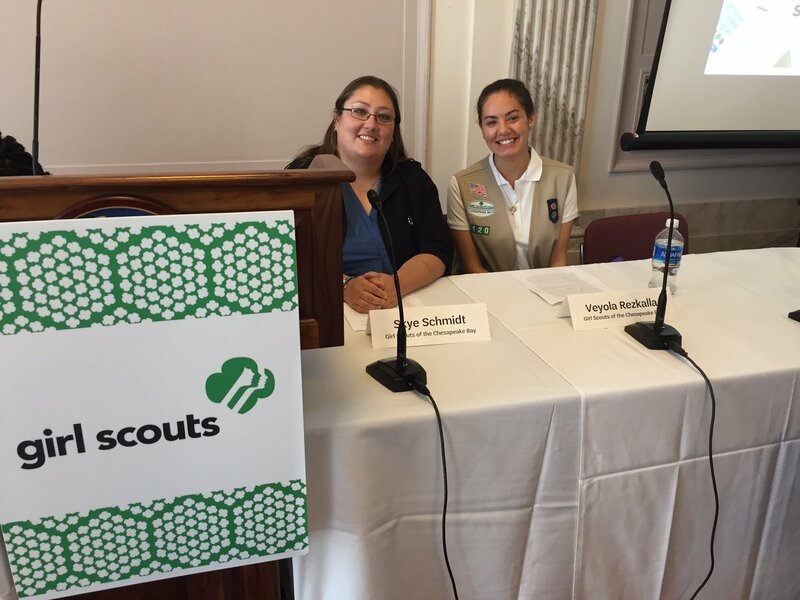 On June 28, Girl Scouts and the American Petroleum Institute (API) were joined by Senators Shelley Moore Capito (R-WV) and Heidi Heitkamp (D-ND) at a briefing to highlight to Congress the need to increase girls’ involvement in science, technology, engineering, and math (STEM). The group discussed programs and policies that encourage girls to pursue STEM careers, with Senator Capito, a co-chair of Girl Scouts’ honorary Congressional troop, emphasizing the value of empowering girls with the tools and resources to become STEM leaders. Representatives from both Girl Scouts of the USA and Girl Scouts of the Chesapeake Bay (Delaware council) drove home the unique benefits of Girl Scouts’ STEM programming, and Girl Scout Ambassador Veyola Rezkalla shared how her experiences as a Girl Scout spurred her interest in biology. In front of a standing-room-only crowd, Veyola said that Girl Scouts provided her with hands-on STEM opportunities that instilled in her the confidence to succeed in the field. This fall she’ll attend the University of Delaware, where she plans to major in biological sciences, bringing her closer to her goal of becoming a pediatrician. Veyola and Senator Capito were joined by the API’s Tara Anderson, who discussed difficulties she’s seen in the energy industry’s efforts to recruit more women. Ms. Anderson noted that while growth in STEM jobs has tripled over the past ten years, many girls and women still struggle to see themselves in these careers due to a lack of role models and encouragement during their adolescent years. Hoping to build off STEM programming offered at local Girl Scout councils and boost girls’ interest in the fields, the API is partnering with councils to host “energy literacy” events for girls across the country. And this summer, Girl Scouts will debut a series of STEM badges girls can earn on topics that include cybersecurity, engineering, robotics, and computer programing. Members of Congress and partners like the API are vital allies in advancing policies that allow girls to thrive in the ever-growing fields of STEM. Whether they choose to become the next accomplished astrophysicists or more generally appreciate the science all around them, when they engage in STEM, girls enhance their self-confidence, strengthen their problem-solving abilities, and are more likely to take on leadership roles in their communities. In other words, through STEM experiences, girls gain the skills they need to become successful leaders—regardless where their career paths lead them.